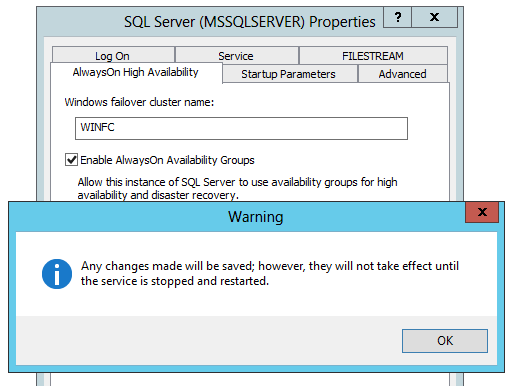 At times after having an AlwaysOn solution implemented, not only may the WSFC Cluster service run down, but also it may be corrupted for whatever reason. As a result of this, we will need to reinstall everything. The big question would be now how to uninstall and delete the Availability Group correctly if WFC service is not running, and to worsen the situation, we do not have any option than deleting forcibly the Availability Groups and, therefore, ending up making a dirty and incomplete uninstallation, indeed. After deleting the Availability Group, we will need to remove the nodes from the WSFC Cluster and, surely, it can be done by uninstalling WSFC Failover Service (instead of destroying the Windows Cluster which cannot be possible in this case). Having done that, we have to create again the Windows Cluster putting each node inside. Finally, we are going to be able to set up the AlwaysOn Availability Group. Ideally, it is the normal procedure for it. 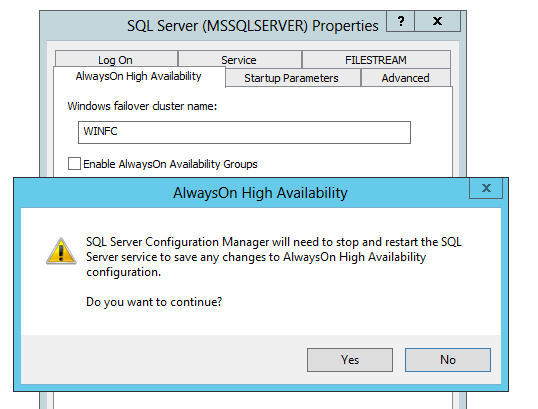 Obviously, this error is due to incorrect uninstallation we had done above and, luckily, to fix it we will have to disable AlwaysOn Availibility Groups feature at database engine service level. Not until you have done these all steps will you be able to create again the Availability Groups you want to. Thanks for reading again!